One cannot have a conversation with Edna Sackson (@whatedsaid) and not be excited about the potential of Inquiry-based learning. Excited I am, for sure. Trouble is, I don’t know much about it really other than that learning is driven by inquiry. So, that’s what I tried to do, ie. design a unit around a driving question (DQ). It had elements of Project-Based Learning (PBL). I borrowed ideas from Bianca Hewes (@BiancaH80) through her blog, PBL workshops and edmodo. 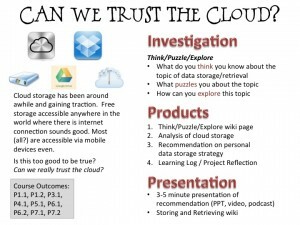 The task in a page - Can we trust the cloud? 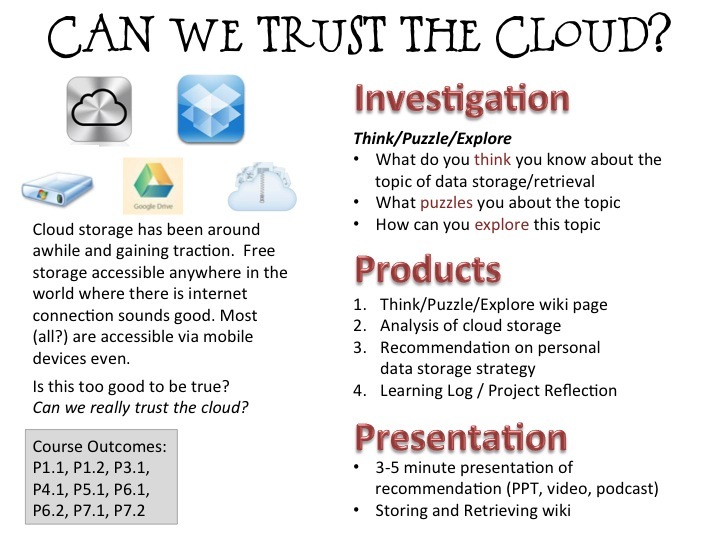 In just over 2 weeks, we studied our topic via the DQ: Can we trust the cloud?. The students went on to explore various aspects of cloud storage. Groups of 2 or 3 looked at several services: DropBox, iCloud, Google Drive and the internal Sharepoint-based intranet. They analysed the hardware and software involved as well as the issues relating to their chosen service provider. It was not surprising for them to conclude anyone’s personal data storage strategy should include more than one approach, ie have a variety of options such as portable hard disks, etc. The wiki was another inspired move. None of them have ever contributed to one. So, I set up a sandbox version first, called About Me. I put my own entry as an example and got them to create their own pages. This allowed them to play with the Sharepoint wiki features as well as give me a quick way to get to know them. The lesson allocated to this “play time” was well worth the benefits. It was a good investment. In the end, the class had shared notes on the topic that each of them contributed to (granted in varying degrees of quality). For a task that had no grade attached, I was pleasantly surprised and moved at the level of engagement. They worked; some harder than others but they all worked. Can they do better? For sure! I am so happy with and for them. But my question remains, is this inquiry-based learning? Is that question even important? What a great driving question. You got the kids engaged in their own inquiries on a subject that is relevant to them… AND you had them DIScovering and UNcovering, while you still managed to cover what had to be achieved. Is this inquiry based learning? Sure. Does it matter what it’s called if the students were engaged and great learning took place? Not in the least! Thank you for your wise words and continued support. It means so much to me AND I’m glad I got my focus right, ie. student learning. Pingback: Love2Learn - What’s your (teaching) style?